Following weeks of carefull preparation, pulling together all the detailed elements it takes to get a classic vehicle of this heritage together it was time for the Steve Kay Customs team to head off Stanford Hall VW show where it would be placed with some of the most special cars at the center of the show. Following an early start the split beetle was set up in the historic section in front of the grand hall taking its place with the other vehicles in its class and as the crowds started to enter and the sun started beat down on the tranquil surrounds of the country manner it felt like a perfect summers day. For classic VW restoration enthusiasts Stanford Hall is probably one of the premier shows of the year and as the aficionado’s or taste gathered to scrutinies every inch the hard work and attention to detail seemed worth it. 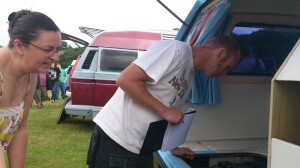 Just a few pictures of Steve Key judging at Tatton park for the VW North West car Show. 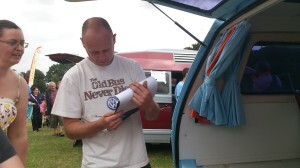 Steve representing his business was asked to judge the T25 custom and stock campers.